Abstract: Just as light can be left- or right-circularly polarized, fermions too can be ascribed a handedness, or “chirality”. 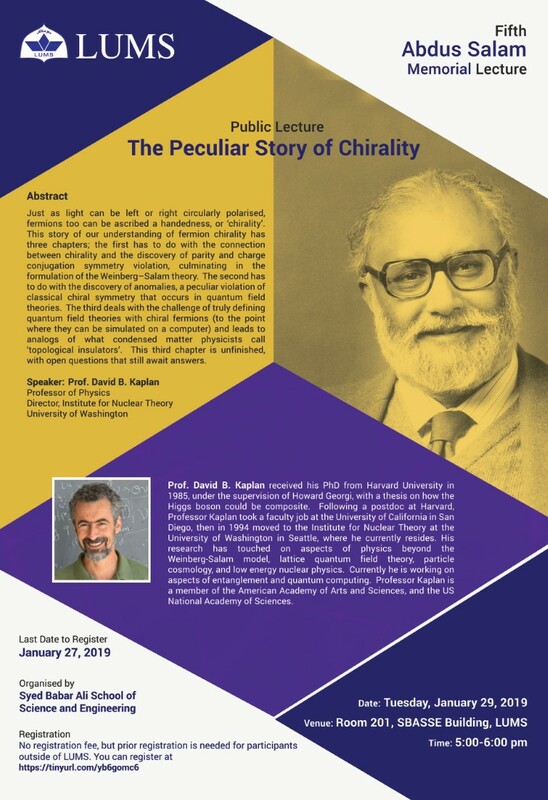 This story of our understanding of fermion chirality has three chapters: the first has to do with the connection between chirality and the discovery of parity and charge conjugation symmetry violation, culminating in the formulation of the Weinberg-Salam theory. The second has to do with the discovery of anomalies: a peculiar violation of classical chiral symmetry that occurs in quantum field theories. The third deals with the challenge of truly defining quantum field theories with chiral fermions – to the point where they can be simulated on a computer — and leads to analogs of what condensed matter physicists call “topological insulators”. This third chapter is unfinished, with open questions that still await answers. David Kaplan received his Ph.D. from Harvard University in 1985, under the supervision of Howard Georgi, with a thesis on how the Higgs boson could be composite. Following a post-doc at Harvard, Professor Kaplan took a faculty job at the University of California in San Diego, then in 1994 moved to the Institute for Nuclear Theory at the University of Washington in Seattle, where he currently resides. 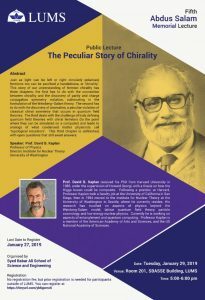 His research has touched on aspects of physics beyond the Weinberg-Salam model, lattice quantum field theory, particle cosmology, and low energy nuclear physics. Currently, he is working on aspects of entanglement and quantum computing. Professor Kaplan is a member of the American Academy of Arts and Sciences and the US National Academy of Sciences.